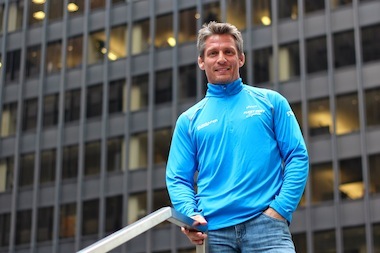 OLD TOWN — A former Olympic runner and jiujitsu black belt is combining his skills to teach Chicago runners self-defense. Todd Williams invented the RunSafer program a little over a year ago with a goal of giving runners the tools to defend themselves if they are attacked. Williams is hosting two free 60-minute classes Sunday at Fleet Feet Sports locations in Chicago. "The psychology behind it is you can't lose. This situation, you are on self-offensive mode," Williams said. "You use whatever the hell you can to stay alive." The class will give runners tips on how to stay aware of their surroundings and show them what to do if something happens or someone grabs them. The first free class is at the Old Town Fleet Feet, 1620 N. Wells St., at 11 a.m. Sunday, and the second is at the South Loop location, 150 W. Roosevelt Road, at 6:30 p.m.
Williams retired from competitive running in 2003 and began training in jiujitsu on the path to earning his black belt in 2011. All the while he was selling specialty shoes to running stores in the southeastern region of the United States. At each store he noticed mace, sound devices, instructional self-defense books, reflective gear and safety devices for sale. "Nothing really had hands-on self-defense for a smaller person if they were out on a run and somebody grabbed them," Williams said. Williams is a two-time Olympic runner, having competed in the 10,000-meter competition in 1992 and 1996. He's earned 21 U.S. running titles and ran his best-ever marathon in Chicago in 1999 when he finished seventh. Williams took the passion that drove his running career and used it to quickly build his new business of protecting runners. So far he's taken the tour to 70 shops across the U.S.